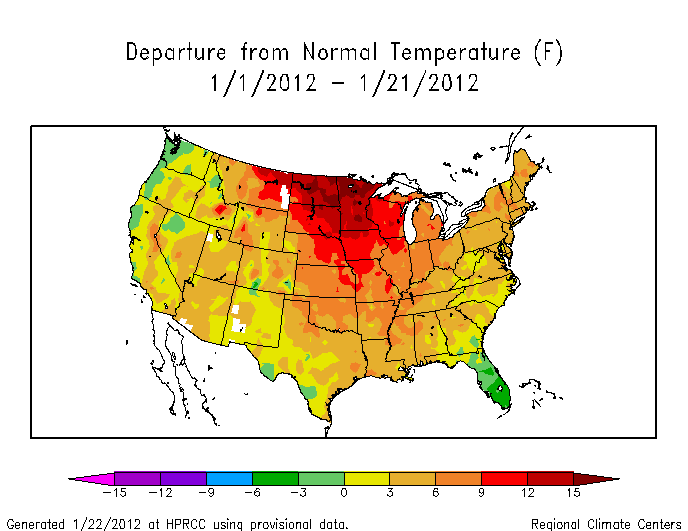 As we near the end of January, winter 2011-12 will go in the books as a very warm winter thus far across much of the nation. December finished with a temperature departure of +5.8 in NYC, and January should finish solidly above normal (at least +2), given the next week will not feature below normal temperatures. The monstrous +AO vortex which has been dominating the weather scene over the arctic has finally met its demise, after 60-70 days of torturing snow lovers in the Great Lakes and Northeast. However, we’re not exactly seeing a reversal in AO modality. While the stratospheric warming and lower solar values have played a role in weakening the vortex, there’s nothing that indicates the AO and NAO will plummet into the tank (negative) ala 2009-10 or 2010-11. Instead, NAO/AO values will probably remain near neutral over the coming weeks, with a slight edge toward the negative side. This is certainly a drastic improvement from December and January, but it’s important to say that we’re impoving from one of the warmest patterns imaginable in the Northeast. The PNA looks to continue with a near neutral regime overall – low amplitude ridges moving through the Western US. These ridges have not done much to cool down the Northeast US so far this winter, largely b/c of the strongly positive NAO and AO. But now that these two indices have neutralized, it will be much easier to get some polar air into the Northeast. Notice I said polar airmasses — the neutral AO/NAO also suggests that major, long lasting arctic air will not attack the Northeast over the next few weeks. The MJO tropical forcing has been unfavorable for Eastern cold much of this winter, circulating through the typical Nina octants of 4-6, and avoiding octants 7-8-1 like the plague. 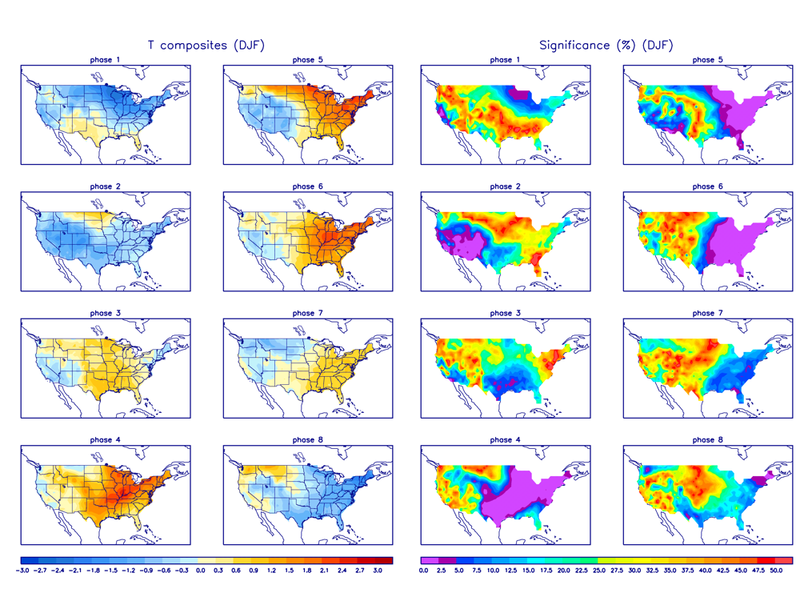 If we take a look at January temp departures so far in the US, and compare that to the current phase of the MJO, we’ll notice a pretty apparent similarity. MJO forecasts over the next 10-20 days indicate more of the same — octants 5-6. There is a hint of phase 7 in the later period by some ensemble members, but we’ve seen this trick many a time over the course of the winter. Forecasts for MJO phase 7 gradually shift to the circle of death, and more unfavorable phases as the time frame approaches. Hence why I’m not confident for conducive tropical forcing at least through day 15. Maybe we’ll see some help from the tropics after February 15th, but that remains to be seen. So what we have going forward is MJO forcing similar to what we’ve seen all winter – but then wouldn’t February blowtorch in the East as well? La Nina climatology tends toward a warmer the normal temp pattern in the East during February, particularly if we have a positive modality of the NAO and AO. As mentioned earlier, model consensus is fairly strong for a neutral to slightly negative AO over the next few weeks, and an NAO near neutral. Some model runs have attempted to initiate a west based, Greenland block, then other runs have taken it away. Most winters with a very powerful +AO/vortex in the front part of the winter don’t turn out well in the Northeast corridor. This is evidenced by snowfall totals in NYC — virtually every December since 1950 which featured less than 3″ of snow in NYC, was a below normal snowfall season. This winter, NYC had nothing in December, which bodes well for a below avg snow season. Keep in mind this does not mean a total clunker of a winter; I could see a couple events bringing us up into the 10s or even 20″+, depending upon how March plays out. The one exception I found was the winter of 1977-78, where NYC saw less than 2″ through Jan 1st, yet finished the winter with 50″+. The ENSO state was completely different that year, with a weak nino (which tend to bring snowy mid to late winters). The point remains — while obviously its not guaranteed, the chances of NYC seeing 28″+ for the winter season are very, very low. 1) Global indices in a more neutral state, which will allow for stronger shots of Canadian air into the Northeast, but a continued lack of negative NAO/blocking in the north atlantic means these cold spells will be moderate, and transient in nature. 2) MJO forcing unfavorable adds steam to the warm card heading into February, but weak ridging over the West coupled with the AO/NAO states near neutral will keep temperatures from soaring consistently well above normal ala December and January. 3) Snow chances will be better than the past 2 months, although that’s not saying a lot, given the pattern so far this winter has been wretched for snow lovers. I would watch the end of January into early February for a storm chance, as we see brief ridging in the West. Beyond that time frame, nothing in this pattern screams major snow or KU event, but a seasonable pattern at the most conducive time of year climatologically for snowfall means some light or moderate snow is possible (as we just saw in the Northeast). 4) It’s easy to be optimistic heading forward after the past 2 months, but what we’re looking at for February is essentially a typical month winter wise, which will make ski resorts much happier. Temperatures near normal overall, AND February should end up the coolest month of the meteorological winter in the Northeast (again, not difficult to say after a +6 December, and very warm January). But with that said, I’m not anticipating temp departures to be cold or very cold across the Northeast; instead, a near average regime (-1 to +1) is probable. 5) Building off of point 4, February should also be the snowiest month of the meteorological winter in the Northeast (not hard to do after a virtually snowfall dec and jan thus far), with a temp pattern not far from normal, which is sufficient at this time of year for snow possibilities. The next 7 days will be mild, with better shots at snow the end of jan into feb.
6) Since the strong AO vortex event has reached its demise, its also unlikely that March will feature a strongly positive NAO or AO. That being said, I believe March will provide more opportunities for winter weather than both December and January in the Northeast.